It all began in the chaos of the Old Quarter of Hanoi, Vietnam. 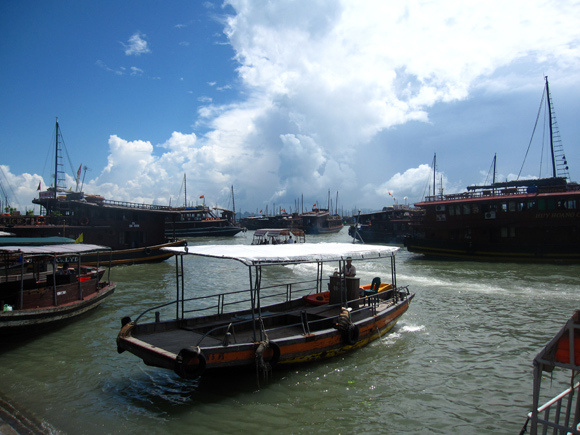 It was a struggle to walk around to various tour companies, trying to search out the best rate and attempt to make sense of all the different classes of boats offered for a tour to Halong Bay. 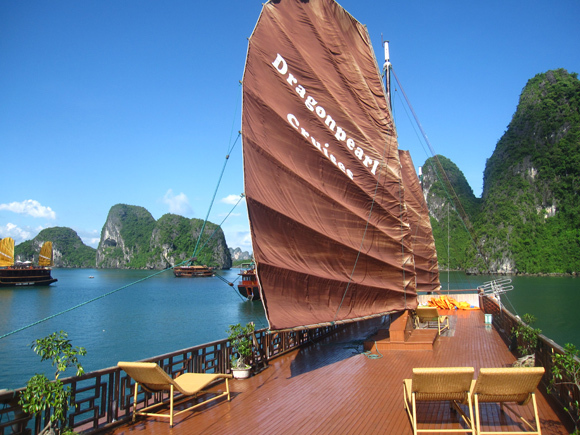 The normal procedure is to book an all-inclusive single or double night aboard a Chinese style junk to fully enjoy the beauty. The tour usually includes the pick up and van ride from your guest house in Hanoi, as well as everything else until you are dropped off back in Hanoi. After asking around and getting frustrated and confused due to all the crafty Vietnamese salesmen trying to pitch their tours, we decided it would be best to just drink a few cups of Vietnamese coffee and think about it. There seemed to be so many random options: the party boat, the 2nd class boat, 1st class, the Dragon fancy boat, the VIP boat, the extreme honeymooners boat – I think the list went on forever…and they were all priced just slightly different. Each tour company had ancient photographs of each class that were basically impossible to see, offering little help in the decision process. So in the end, I just sort of went with my gut feeling and booked the 1st class boat for the price of about $30 from a woman who I thought looked the most honest. Everything went according to plan, the van picked us up and zoomed us along with the masses of other tourists to the gorgeous Halong Bay. 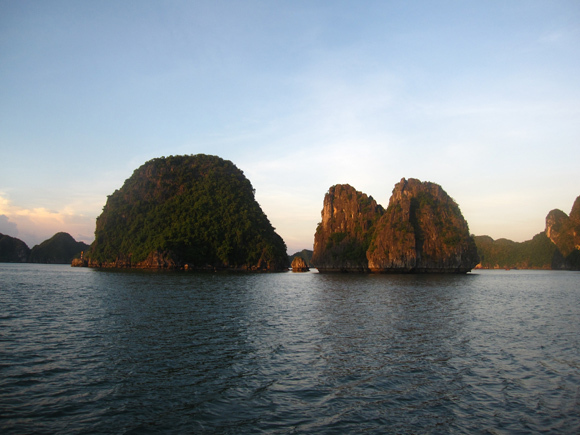 The scene morphed into a dramatic landscape of limestone pillar mountains jetting vertically up from the water below. We got dropped at the common boat loading dock along with the hordes of others. Everyone was eager to board their boat while at the same time getting frustrated by the long lines and the harsh rays of the mid-day sunshine. Everything was confusing and disorganized. Tour guides scrambled in every direction leading their pack of sheep through the mess of humanity. I wasn't so convinced if he spoke truthfully, or if he was looking for a tip. Nevertheless, we were ushered to a different boat that was supposedly a VIP boat (whatever that really means in Vietnam). We boarded the Chinese stye junk and started slowly cruising our way around the surreal landscape. Once on the boat, things were totally opposite; I couldn't hear the piercing sounds of honking motorbikes, the clammer of large amounts of humans, nor the annoying shrieks of the tour guides. Life was good once again! Relaxing on the top deck of the boat at sunset was unbelievable – this was the picture of Halong Bay that I really wanted to see. The sunshine became softer and softer as it wrapped its rays around each pillar of limestone, bouncing off the calm moving water. It was peaceful and supremely gorgeous. The next day we floated back to the harbor point, back into the scurry of everyone else and back into the racing van. We were dropped off as promised back at our guest house all safe and sound. Though the lack of organization and the dishonesty of so many tour companies made things a bit frustrating to arrange, the escape onto the top deck of the peaceful boat floating in the middle of Halong Bay was a priceless experience! Hmm..I love the photos..when I went to Halong Bay it’s was quite foggy – same as Hanoi and the scenes was not that perfect. But I enjoyed the silence :). I booked a 3 day trip to Halong Bay through a place called Kangaroo Cafe Tour located at 16 Hang Be Street in the Old Quarter of Hanoi. I had heard a lot of stories from other travelers about being ripped off by other outfits selling tours. The Kangaroo Cafe staff were friendly and very helpful and the whole trip was exactly as they advertised. It was a great experience. Every trip is an experience, let’s hope that you’ll have only great experiences :) It’s always a captivating experience to read your journeys! I still rate Halong Bay as one of the best trips in Vietnam – I do think its well worth making the time to do more than a one night tour though – its just magic when you get away from that dock! I’m not sure where the author obtained an overnight stay on the boat for this price. You might pay ten times that for two nights, but the cheapest trip on this same boat comes in around five times that price booked online. Perhaps he has a sweet face or a giant “I work for Lonely Planet” sign on is head! Wow… Your photos are so beautiful. I love them. I myself just comeback from Halong Bay but the weather is not as perfect as your trip. 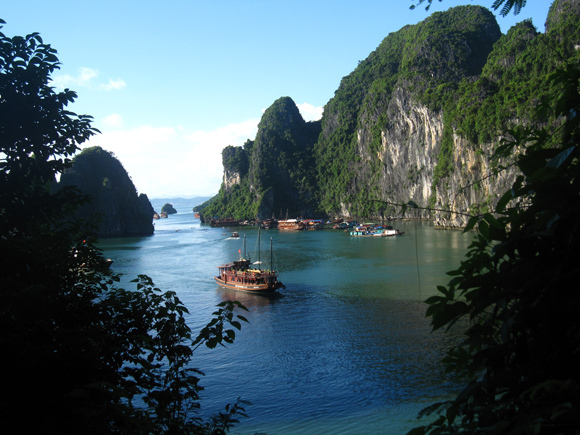 Is your cruiser Halong Phoenix? Look like the same as the cruiser I did stay. I luv the photos very much. 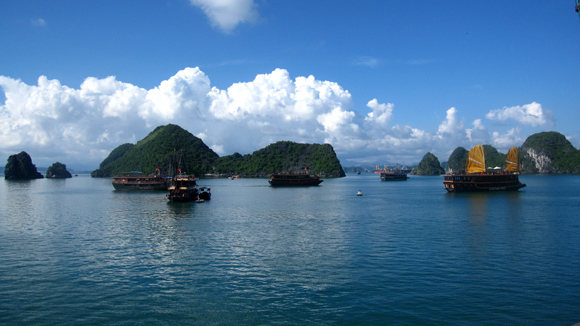 i’ve had a trip on Halong bay on a cruise. And remember it. I have done the day trip and I don’t believe there is really any difference in what price you pay. I would suggest you not be upsold on the food, it is just average fair for Vietnam. All alcoholic drinks on the boat are at least 3X what you would pay in Hanoi. I asked a few people on my boat what they paid and everyone quoted a different price. The upsells are just extra money in the brokers pocket. Don’t pay in advance for any activities like kayaking as you can pay the same price when you are out on the bay directly to the operator. I would recommend going to Halong Bay, just keep in mind that it is about 4hrs travel each way on the bus and less than 4hrs on the boat. But hey, you have come this far and its a nice 4hrs.